Housing 21 is a provider of care, health and housing for older people based in West Sussex. The composter was selected on the basis that it was a local solution for diverting food waste, had a low cost of installation, low maintenance, vermin proof and easy to use. An initial trial was developed by resident social engagement practitioner Anthea Rossouw, the success of which led to the community project “Waste is Mine, it’s Yours” . 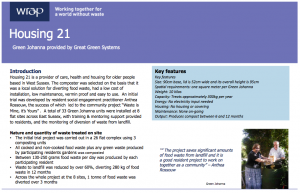 A total of 33 Green Johanna units were installed at 8 flat sites across East Sussex, with training & mentoring support provided to residents, and the monitoring of diversion of waste from landfill.